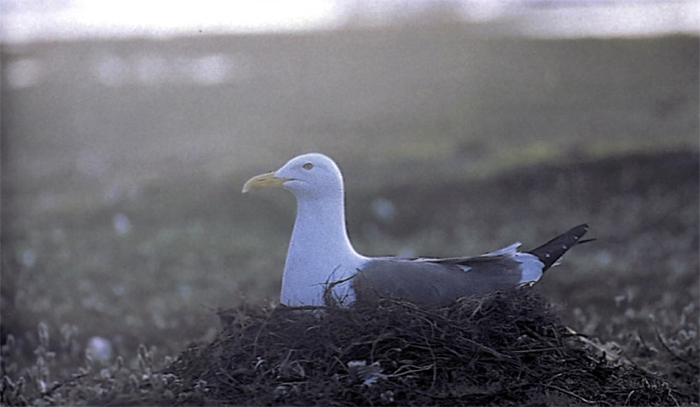 'Nesting 'West Siberian Gull' Larus heuglini antelius, Chayachii Island, Pechora Sea, Russia, July 1996 (V.A. Buzun). 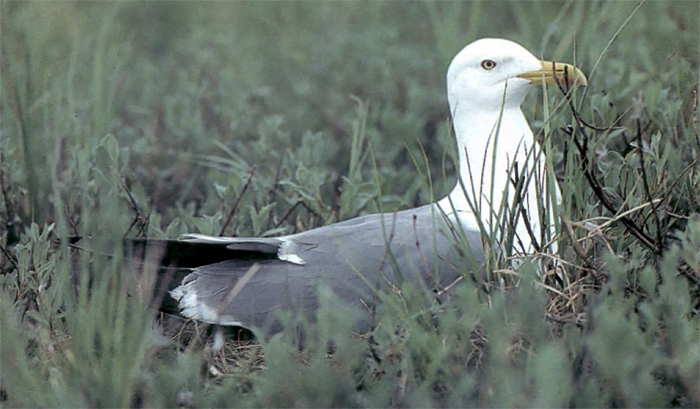 A proportion of West Siberian Gulls nests on marine islands in elevated areas in the supralittoral zone; for details, see Buzun (in press). In addition to the specimens from the Russkii Zavorot peninsula, specimens from both the eastern (Obskaya Bay) and western (Kanin peninsula) parts of the breeding range of antelius were examined. Although the western border of the breeding range can be determined with precision (Filchagov et al. 1992), the eastern limit and the area of overlap or intergradation with heuglini have not been sufficiently studied. The analysis of the geographical variation of mantle colour by Stegmann (1934) demonstrated that the area of overlap between these two forms is extensive and lies between the Gydan peninsula and Yenisei Bay. The samples from the River Ob considered here, therefore, represent the extreme eastern populations of antelius, with the Russkii Zavorot population representing the centre of the range. As shown in table 1, the mantle colour of antelius darkens from east to west (see also Stegmann 1934), There is, however, considerable variation at any one site, such that, although dark individuals are more frequent in extreme western areas, it is difficult to find any darker than the most dark-mantled birds from the Russkii Zavorot peninsula (‘Slate-colour’ in Ridgway 1912). The wingtip pattern of antelius also varies from east to west (table 2). The frequency of the dark variant of P10 (one or two small, closed mirrors) increases, while the frequency of birds showing two large open mirrors decreases by 1.5 times, between the Russkii Zavorot peninsula and the River Ob. Variation in size of the white mirrors is, however, independent of the total area of black pigment in the primaries: the standardised indices (corrected for other body measurements as described earlier) of black pigment hardly vary from east to west, although there may be a slight reduction in black on P9. The uncorrected raw data erroneously suggest a gradual reduction in black pigment from east to west. It follows from table 4 that variation in wing length from east to west is simply an artefact of small sample size. When the sexes are combined for samples from Kanin and Russkii Zavorot, all the differences are not significant (Wilcoxon t-test). There are no significant tendencies for weight and other body-size parameters to increase towards the eastern end of the breeding range. If clinal size variation exists, the trends are extremely weak. l thank my colleagues, Pranas Mierauskas and Edmundus Grelrnas, for their support in the difficult expedition to Yamal, and for allowing me to use their data from the Kanin peninsula. I thank P. Tomkowich for giving me the opportunity to work with the collections at the Zoological Museurn at Moscow State University and E Greimas for collaboration during work on skins. [Additional, Mars Muusse: some Lesser Black-backed Gulls have been recorded in (eastern and central ) Europe in winter, still growing outer primaries by January or February. The possibility to identify such birds as heuglini is discussed HERE. 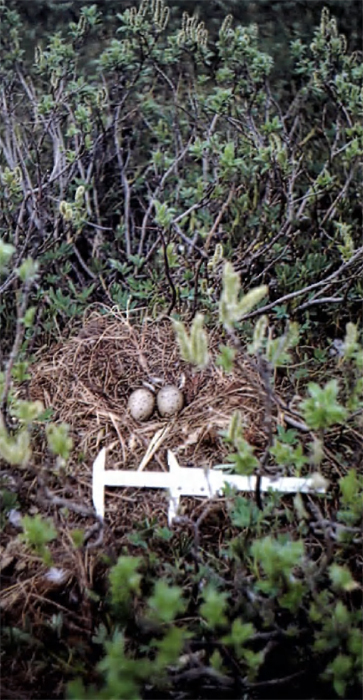 Nesting adult and nest site (below) of 'West Siberian Gulls' Larus heuglini antelius, Russkii Zavorot peninsula, Malozemel'skaya Tundra, Russia, June 1996. Concealment of nests is not typical, but some pairs nesting on mainland tundra use willows Salix arctica or S. glauca to shelter the nest. For details, see Buzun (in press).The callipers in plate below show 10 cm. 3cy heuglini in November-December normally show a plumage very much similar to adult birds. A variable number of immature features may still be possible, but best clue to age this group probably is the presence of broad dark centres of the greater primary coverts. Small, sharply defined centres on slate grey feathers probably is possible in full adults as well, but when the centres are broad brownish-black and the tips of these greater primary coverts are pale whitish, this may be good indication for 3cy birds. Furthermore, black may still be apparent in the rectrices, some brown wash may be visible on some wing-coverts and the bill-band may be obviously broad in third winter birds. Your images here? Do you have heuglini in this plumage?